Downconverts real passband signal data of a user-specified bandwidth. This node can be used in simulated as well as hardware-equipped applications. Signal for downconversion in passband form. The center frequency of the passband, in hertz (Hz). This frequency is downconverted to 0 Hz. Enter the expected carrier frequency of the incoming signal for downconversion. The bandwidth, in Hz, of the passband signal data. The node ignores this parameter if you set the reset? parameter to FALSE. The ripple in the passband, in dB. The ripple is the ratio of the maximum deviation from the average passband amplitude to the average passband amplitude. The value must be greater than zero. The start of the stopband, Hz. A Boolean that determines whether to compute the stopband start or use the value that you specify in the stopband start parameter. TRUE Computes the stopband start based on the carrier frequency and passband bandwidth parameters. FALSE Uses the value that you specify in the stopband start parameter. The stopband gain, in dB. The gain is the negative of the minimum attenuation of the stopband with respect to the average amplitude of the passband. A Boolean that determines whether to perform software filtration on the downconverted data. 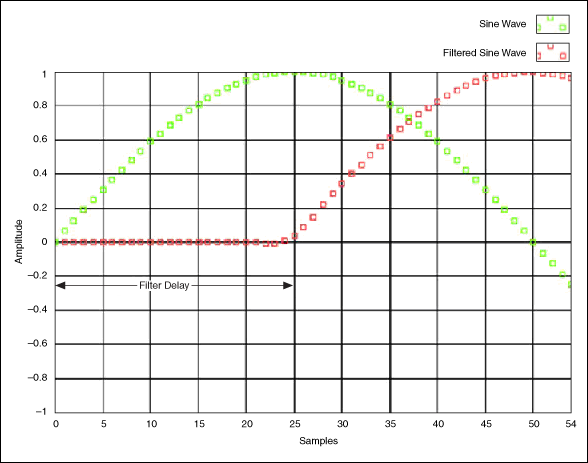 TRUE The node filters the downconverted waveform parameter using a software FIR filter. FALSE Disables the downconversion filter and generates unfiltered data in the downconverted waveform parameter. A Boolean that determines whether to use values specified by the initial phase, passband bandwidth, enable filter, passband ripple, and stopband start parameters. TRUE The node uses these parameter values at each call. FALSE The node ignores these parameters and continues using values supplied in the previous call. Reusing previous input values is useful when sequential data blocks represent contiguous signal data. The initial phase, in degrees, of the software local oscillator used in the downconversion process. The node ignores this parameter if you set the reset? parameter to FALSE. Use the initial phase parameter to match the phase of the incoming modulated carrier and the local oscillator(s) of the downconversion process. The downconverted signal in complex envelope format. The deviation of the passband gain from the nominal gain of 0 dB. Number of taps in the filter. If carrier frequency is greater than passband bandwidth, the filter stopband begins at carrier frequency. If carrier frequency is less than passband bandwidth, the filter stopband begins between carrier frequency and (2 * carrier frequency) - (passband bandwidth/2).